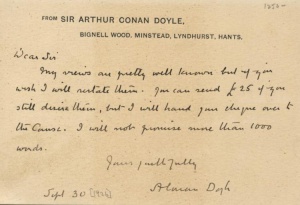 This notecard was written by Arthur Conan Doyle on 30 september  from Bignell Wood, Minstead, Lyndhurst, Hants, to an unknown correspondent. My views are pretty well known but if you wish I will restate them. You can send £25 if you still desire them, but I will hand your cheque over to the Cause. I will not promise more than 1000 words. This page was last edited on 17 November 2017, at 00:49.